You probably know already that I hate to bake. Multiple ingredients and all that measuring just doesn't interest me very much. I make the exception with a few recipes since I really do love baked goods and homemade is so much tastier than store-bought. I especially love recipes that start with a boxed cake mix. Those recipes make it so much easier for this grumpy baker! Occasionally, when Joe runs out to pick up the Sunday paper, he'll surprise me with a red velvet muffin stuffed with a sweet cream cheese filling. They are a rare treat, since a lot of time they are sold out by the time Joe he gets there. Ever since I first started making Gooey Butter Cookies (another cake mix cookie), I've been wanting to try them using a red velvet cake mix in place of my usual yellow and chocolate cake mixes. I just never got around to trying it. 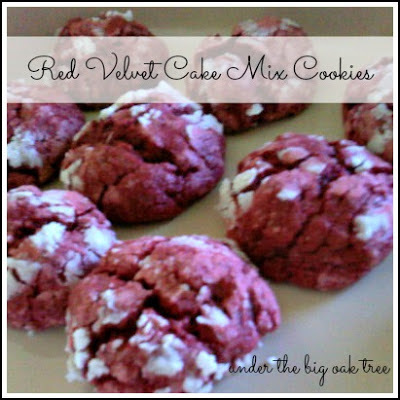 When it came time to make cookies to take to our family's annual Christmas Eve party, I made it a point to try the Red Velvet Cookies. Just as I suspected, they were a success! The only thing that would make them better is if they were frosted or filled with a cream cheese frosting! Here's a quick picture that I snapped with my phone just before packing them into the tin before we left for the party. In a bowl, combine cake mix, egg, cream cheese and butter until well combined. Cover the cookie dough and chill overnight (or at least 4 hours). Roll dough into balls, then roll in powdered sugar. Bake in a 350* oven for 9-12 minutes. Thanks so much, Alison, for linking this recipe in my Blog Hop! They look so pretty and sound delicious! These look good. As it happens, tomorrow my post is on to-die-for brownies made from a mix with some homemade frosting. Come back in the morning and drool!